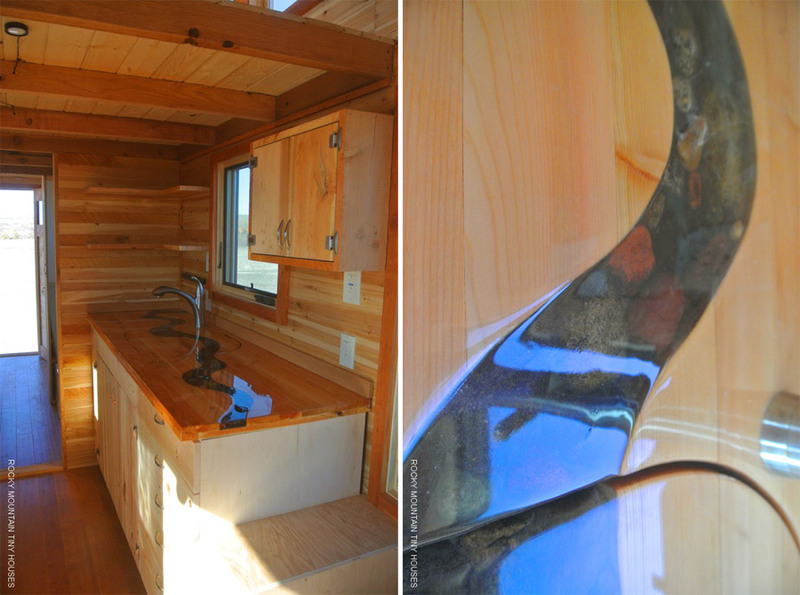 A 32′, 288 square feet (including loft) tiny house on wheels built by Rocky Mountain Tiny Homes in Durango, Colorado. Do you make this for people to buy? How much? I love the wood. Not enough pictures to really “see” it all. I do not like the walk through bath “room”. Nor do I care for the Cold Refrigerator next to a Hot Oven. Just doesn’t make sense to me. 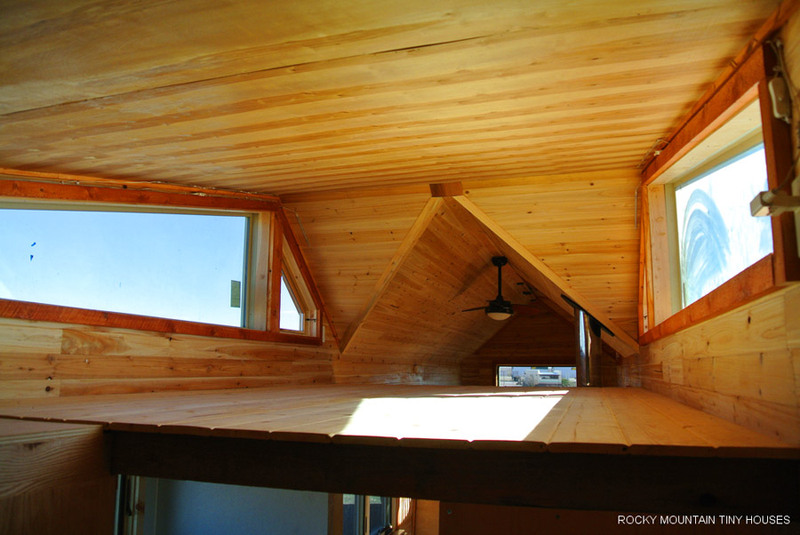 The wood for the floor of the loft is very thin, how strong is that? Is that for storage or what? It looks much longer than what the photos show, so I’m not putting it all together correctly or not all photos are there? Sure is pretty. Thanks for showing this. The insulated refrigerator next to the usually off stove doesn’t have any issues. Sometimes there is ice in the milk, and this is living currently in El Paso, the land of sun and desert. Part of the joy from being in a tiny house is spending quality time outside. 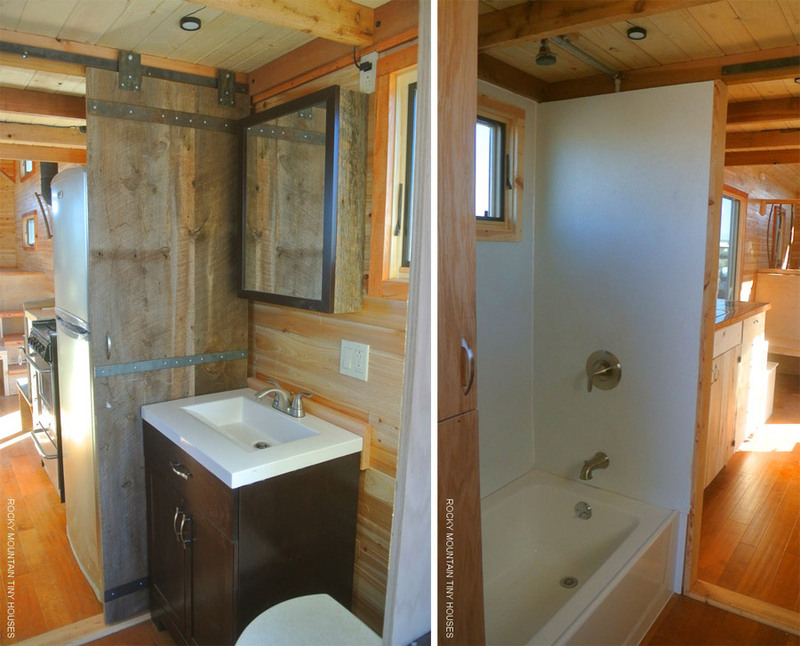 The bathroom has a sliding door that separates the back of the house from the front. For myself, my wife, and my two daughters (2 years old and two weeks old), this, along with the full size bath tub works perfectly. If you bother checking out the RMTH website, you will see that Greg graduated from the University of Texas with a degree in Architecture. He understands such things as flooring being able to support weight with proper load bearing structures underneath. That being said, the loft is where we have our queen mattress (with amazing views out of the windows). 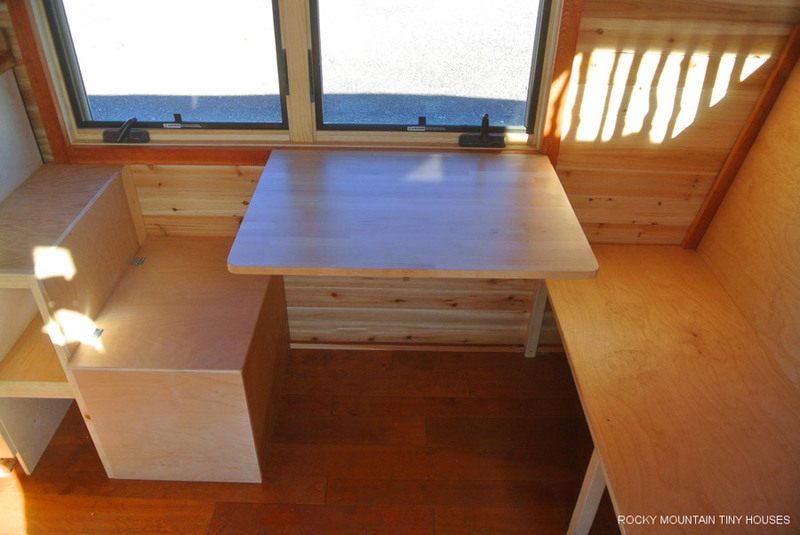 Greg added a hinged pair of redwood boards that act as a headboard toward the tow side. 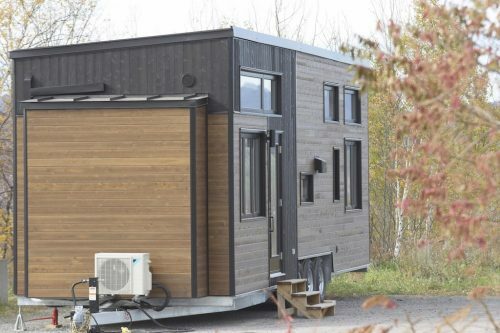 It’s 32 feet long, he has a video on his website and Facebook page, it’s just a lot of detail to cover with little space, so it makes it seem longer through pictures. Thanks for criticizing my house. I would love to see yours. Love this!! Love the stairs and it looks cozy. Not too small to feel suffocating! I am so in love with their countertop! The roofline is beautiful too. Big and beautiful. 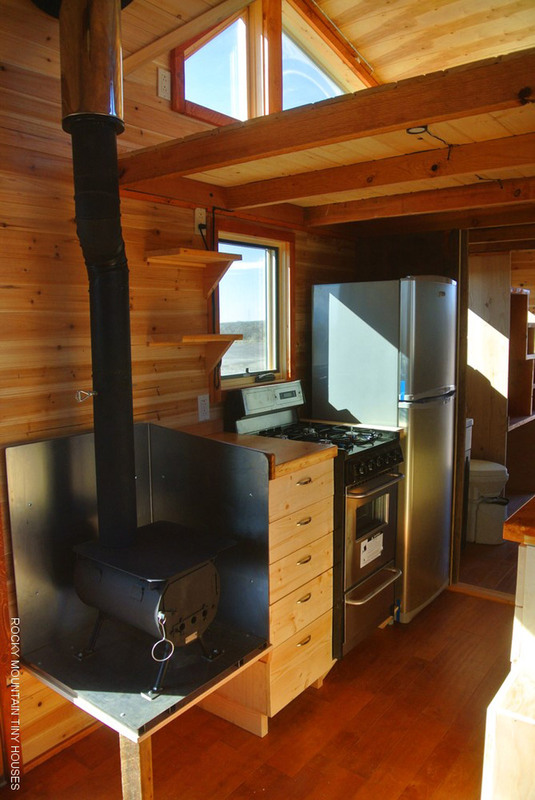 I do not like the heater, but I do understand the choice of a wood burner for a house, off the grid in the Western USA. I do like the headroom upstairs. the buyer will doubtless be very happy there for either full time or part-time living. Thanks! We are very happy with the end result. Greg customized the house perfectly for us. I’m 6’1″, and can walk in the gooseneck without hitting my head. We’re in the process of converting that portion to a functioning space for our girls. It has been an amazing experience. 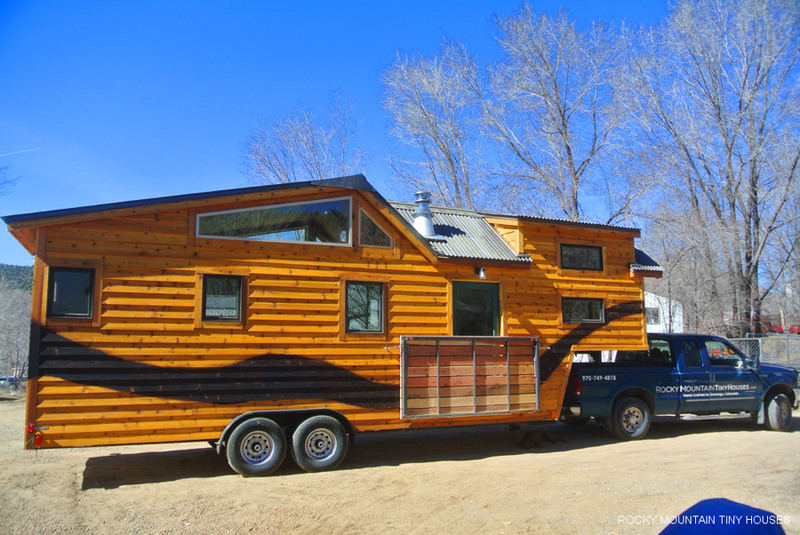 Love these tiny homes and hubby and I are moving south next year to Mississippi . We do not want to buy due to the high cost of hurricane insurance and such so we plan on living with the ability to move fairly quickly if a hurricane heads towards Biloxi , Gulfport ,Waveland area again . We have 2 Adult children and seven grandchildren ( ages 11 through 20 ) and the need may arise to temporarily house all of us . 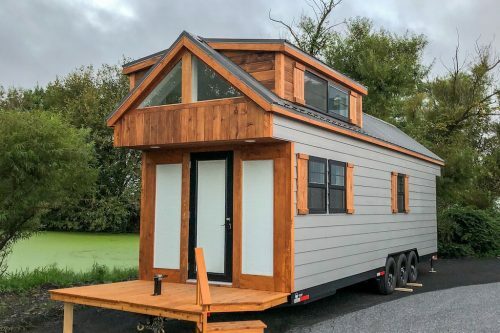 Do you make a tiny home that would be able to do this , how portable would it be and how much would it cost ? Would also like solar panels on the roof and portable internet capabilitites . Also someplace to store a generator and maybe a lawn rake or gardening tools . Need lots of storage as well as I do quilting and need somewhere to put all that stuff !! Thanks for the love on our home. Please remember to be careful with your criticisms. 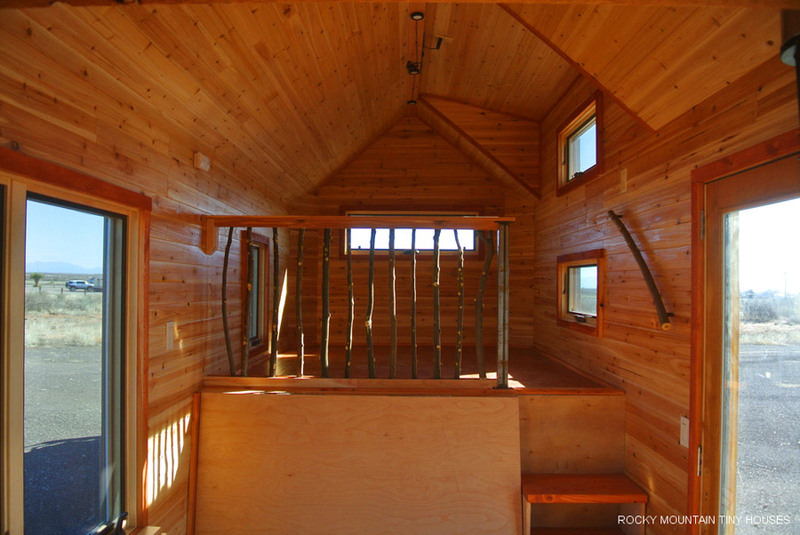 Tiny houses are built to the needs of the owner, not you. We have no control over who shares our houses online, and it’s my guess that most of us don’t really care for the publicity. It takes extra time while travelling to explain that no, I didn’t build it, that it tows great, and that my buddy in Durango built it. At. Every. Stop. To be fair, this is expected, but it still gets annoying if you’re at an RV park and some random group of people comes knocking at your door expecting a tour while you’re trying to wrangle your two year old into a bath, with your wife breastfeeding your newborn. It doesn’t help that the dog goes ballistic at the knock. So please remember courtesy and manners. The chances are good that if we’re outside drinking a beer and socializing, that we’re actually in a mood to share with you. 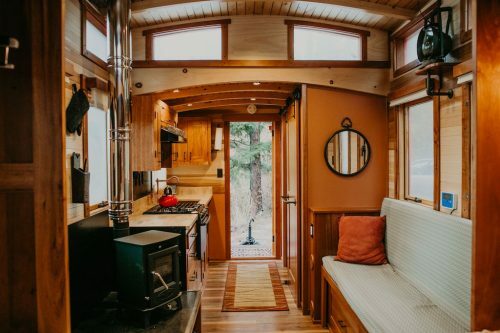 The primary reason for choosing to live this lifestyle is for us to have a home we love to be in wherever we have to move, without all of the baggage that comes with a traditional house. This past year has been our best yet, and we’ve got such great plans, and no attachment to television to derail them. Outside is our living room, and it is phenomenal. And to Becky, I would advise you focus on yourselves first. Trying to build a mobile house around possibly 11-13 people is a logistical nightmare. You’d be best off turning a park model into a bunkhouse with a kitchen and bath at the end if that is realistically your goal. Then you would need an F-550 with a wide-load authorized commercial license to tow it. It kind of defeats the purpose of going small. Kids will be happy camping out in a tent. Very good point about remembering the very real people on the other side of the computer screen, and also courtesy tips for when you encounter an occupied TH; the residents aren’t there to serve as tour guides. Have you thought about printing up a little FAQ handout with “Sshhh–Baby Wranglers At Work” across the top? 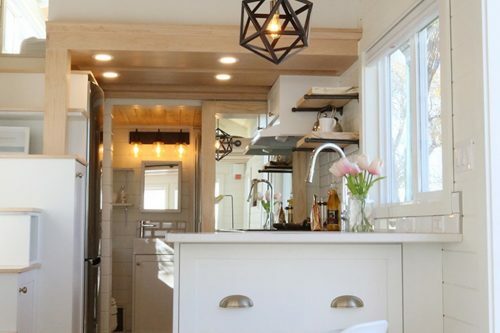 The river running through your countertop, the loft railing, the light, it’s a lovely place. Lucky kids. I don’t expect to buy for quite a while; this is my old-age strategy. Every year brings better ideas and teaches more lessons. A happiest year yet to you all. 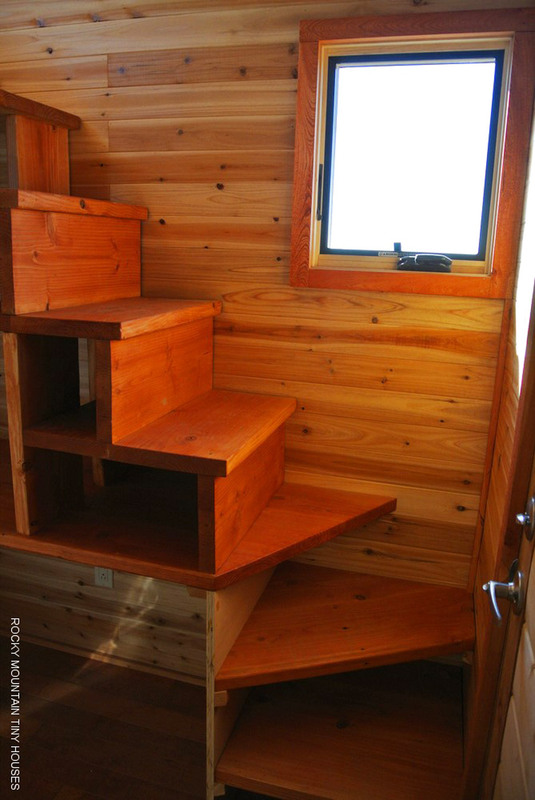 This is fantastic, and what a wonderful usage of space you have created for your family. I love the box seat at the table and that you have installed a FULL SIZE BATH, but my favourite part are the stairs (great stairs) leading to the bedroom area – what an amazing amount of space you have there. And I love the hand rail and the railings – what a great idea to use different contrasts of wood. This wonderful. I could quite easily live in this and be very content. What a wonderful home.